116 Beacon is located on the north side of Beacon, between Arlington and Berkeley, with 114 Beacon to the east and 118 Beacon to the west. 116 Beacon was built ca. 1856. It was originally numbered 108 Beacon, but re-numbered as 116 Beacon ca. 1862 when homes were built on the south side of the street. 116 Beacon is one of seven contiguous houses (104-106-108-110-112-114-116) built ca. 1856 in the same design, all in brownstone with French Academic details, ridge roofs, and a common cornice line (the copper-clad oriels at 106, 108, and 110 Beacon were added in the mid-1880s). 104-106 Beacon, 108-110 Beacon, and 112-114 Beacon are each symmetrical pairs. 116 Beacon was built as the home of banker and stockbroker Thomas Handasyde Perkins, III, and his wife Elizabeth Jones (Chadwick) Perkins. They previously had lived at 37 Chestnut. The land for 116 Beacon was purchased on November 3, 1855, from the Boston and Roxbury Mill Corporation by Christopher C. Chadwick and William W. Tucker, trustees of a trust established on July 9, 1855, to manage property inherited by Elizabeth (Chadwick) Perkins from her father, Ebenezer Chadwick, for her benefit and the benefit of her children. The original deed from the Boston and Roxbury Mill Corporation included a condition, inserted for the benefit of Robert W. Hooper, who had purchased the adjoining lot at 114 Beacon, prohibiting any owner of the lot at 116 Beacon from building any structure in the rear of 116 Beacon that extended any further north than the north wall of 114 Beacon or was larger in dimensions than any structure in the rear yard of 114 Beacon, unless permission was granted by the owner of 114 Beacon. This restriction subsequently was superseded by an agreement on October 20, 1926, among the owners of all of the houses at 104-116 Beacon limiting rear additions for a period of fifteen years. Click here for an index to the deeds for 116 Beacon. The Perkinses continued to live at 116 Beacon in 1857, but moved thereafter to 17 Mount Vernon and then, in about 1864, to 201 Beacon (285 Clarendon). On February 13, 1858, 116 Beacon was purchased from Christopher C. Chadwick and William W. Tucker, trustees, by Samuel Hammond. He previously had lived at 78 Beacon. Samuel Hammond married in October of 1858 to Mary Crowninshield (Warren) Hammond. They lived at 116 Beacon after their marriage and also maintained a home in Nahant. In 1861, the were joined at 116 Beacon by Knyvet Winthrop Sears and his wife, Mary Crowninshield (Peabody) Sears. They previously had lived at 1 Louisberg Square, and by 1862 had moved to 132 Beacon. During the 1887-1888 winter season, the Hammonds were living elsewhere and 116 Beacon was the home of Francis Inman Amory, an attorney, and his wife, Grace Josephine (Minot) Amory. They had lived at 53 Marlborough during the previous season. By the next season, they had moved to 265 Beacon and 116 Beacon was once again the Hammonds’ home. Mary Hammond died in May of 1890. 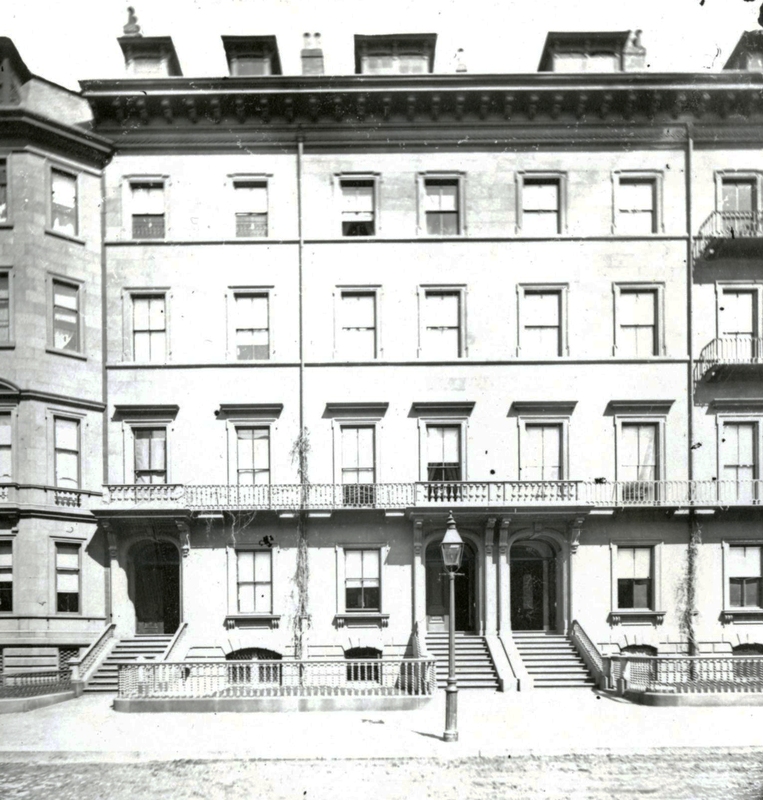 During the 1892-1893 winter season, Samuel Hammond moved temporarily to an apartment at The Grosvenor at 259 Beacon, and 116 Beacon was the home of Richard Dudley Sears and his wife, Eleanor Mary (Cochrane) Sears. They had lived at 302 Berkeley during the previous season. They also maintained a home in Nahant. Richard Dudley Sears was a real estate trustee. In 1881, he had been the first American men’s singles champion in lawn tennis, and was the winner of that title for each of the six following years. 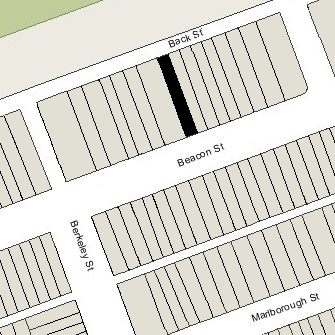 By the 1893-1894 season, Richard and Eleanor Sears had moved to 83 Beacon, and by the 1894-1895 season to 86 Marlborough. 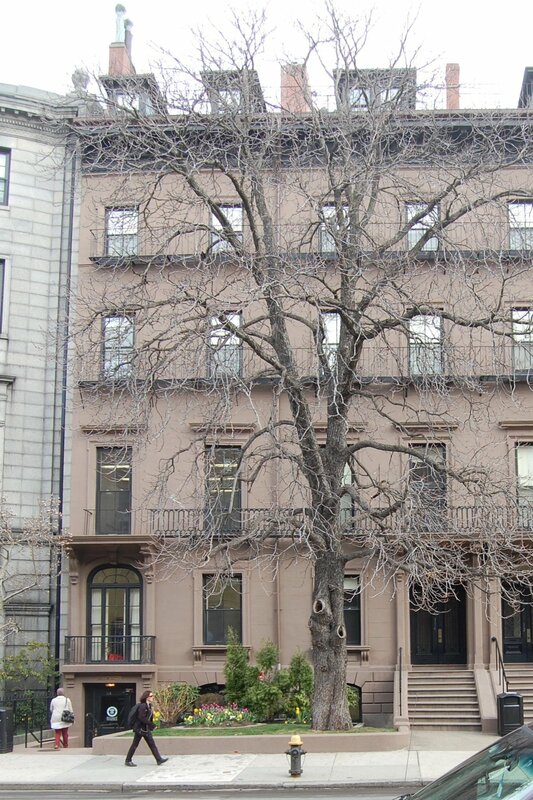 By the 1893-1894 winter season, Samuel Hammond was once again living at 116 Beacon. He continued to live there until his death in May of 1896. On April 24, 1897, 116 Beacon was acquired from the Samuel Hammond’s estate by Eliza A. Hubbard, the wife of Dr. Rufus Peabody Hubbard. They had married in 1896. Rufus Hubbard was a physician and maintained his office at the house. They previously had lived (and he had maintained his office) at the Hotel Pelham, southwest corner of Tremont and Boylston. The Hubbards separated in 1899 or early 1900, and he moved to New York, where he continued to practice medicine. Eliza Hubbard continued to live at 116 Beacon. At the time of the 1900 US Census, she also rented lodgings to two boarders. On October 31, 1901, 116 Beacon was purchased from Eliza Hubbard by Abby Collins Brown and her sister, Rebecca Warren Brown. Rebecca Warren Brown was a Revolutionary War historian and author. Abby Brown died in February of 1907. Rebecca Brown continued to live at 116 Beacon until her death in February of 1914. On June 3, 1915, 116 Beacon was purchased from the estate of Rebecca Warren Brown by Dr. Charles Allen Porter. He was a physician and surgeon, and also was an associate professor (and later professor) at Harvard Medical School. 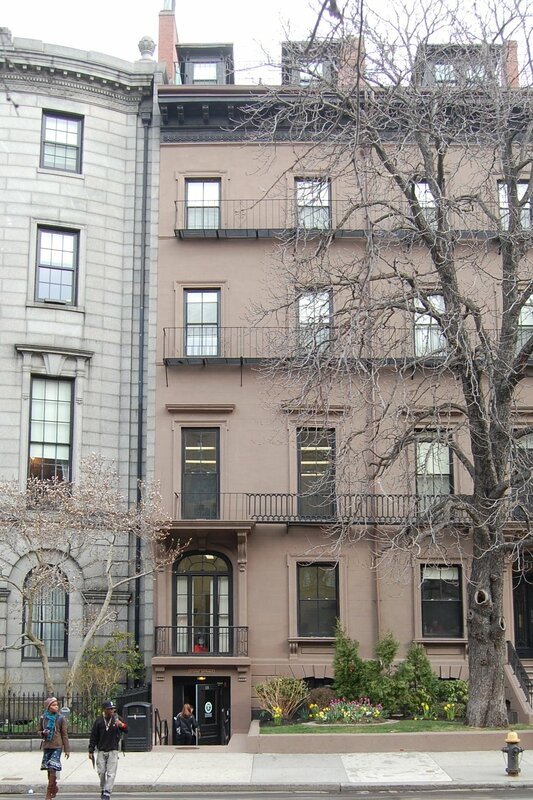 He and his wife, Margaret Cochrane (Dewar) Porter, lived (and he maintained his office) at 254 Beacon. In June of 1915, he applied for (and subsequently received) permission to remodel 116 Beacon, lowering the front entrance to street level and excavating a sub-basement under the front portion of the building. The remodeling was designed by architect William Chester Chase. In 1916, he applied for (and subsequently received) permission to further remodel the building, relocating two windows in the rear of the house. After the remodeling was completed, the Porters moved to 116 Beacon and he relocated his office there. Their children — Isabel, Margaret, and Charles Burnham Porter — lived with them. Charles Porter died in July of 1931. Margaret Porter continued to live at 116 Beacon until 1936, when she purchased and moved to 251 Beacon. She continued to own 116 Beacon and in January of 1937, she applied for (and subsequently received) permission to convert it into a lodging house. By 1937, the lodging house at 116 Beacon was operated by Ella G. (Adams) Eells Haig, the widow of John H. Eells and of Dr. Andrew A. Haig, and her sister, Evelyn G. (Adams) Wardwell, the widow of George J. Wardwell. They previously had lived at 284 Commonwealth. They continued to live at 116 Beacon in 1939. By 1940, Ella Haig had moved to 72 Commonwealth and Evelyn Wardwell was living temporarily at the House of the Good Shepherd, a convent and home for women and children at 841 Huntington (she had joined her sister at 72 Commonwealth by 1941). By mid-1940, 116 Beacon was the home of insurance broker Fred Perkins Kinney and his wife, Lillie W. (Dickerman) Kinney, who operated it as a lodging house. They previously had lived in Jamaica Plain. On October 5, 1942, the Franklin Savings Bank purchased 116 Beacon from Margaret Porter for the amount outstanding on the mortgage it had entered into with Charles Porter on June 9, 1921. On October 15, 1942, Fred and Lillie Kinney purchased the house from the bank. Fred Kinney died in July of 1944. On August 22, 1944, 116 Beacon was acquired from Lillie Kinney by Carlton Lloyd Bain and his wife, Harriet Preston (Kelly) Bain. He was employed with the Internal Revenue Service. They previously had lived in Maine. They continued to operate 116 Beacon as a lodging house. On November 29, 1945, 116 Beacon was acquired from Carlton and Harriet Bain by Matthew Joseph Malloy and his wife, Ione Wilkinson (Lohr) Malloy. They lived at 227 Marlborough and operated the Stratford School at 128 Commonwealth. They continued to operate 116 Beacon as a lodging house. On September 25, 1950, 116 Beacon was acquired from the Malloys by Francis E. Brown. On May 19, 1954, 116 Beacon was purchased from Francis E. Brown by Fisher Junior College (later Fisher College). It also owned 112-114 Beacon and 118 Beacon. In 1961, it acquired 108-110 Beacon, and in 1962 it acquired 102-106 Beacon. In July of 1954, Fisher College applied for (and subsequently received) permission to convert 116 Beacon from a lodging house to a school building and to consolidate the property with 118 Beacon. It cut through connections between the buildings on the basement and third floor levels. As of 2015, Fisher College owned 102-104–106–108–110–112–114-116-118 Beacon, 111 Beacon, 115 Beacon, 131–133 Beacon, 139–141 Beacon, 1 Arlington, and 10-11 Arlington.